What if an MP, a hedge fund manager and a cleric opened fire on their neighbours, their fellow commuters and their congregation? What apocalyptic moment would these events portend? What if a virulent virus nicknamed the ‘sweats’ brought London and other capital cities to a halt, causing chaos in the streets and protracted ‘last drinks’ in the pubs? What difference would the unlikely death from natural causes of a respected children’s doctor make then? 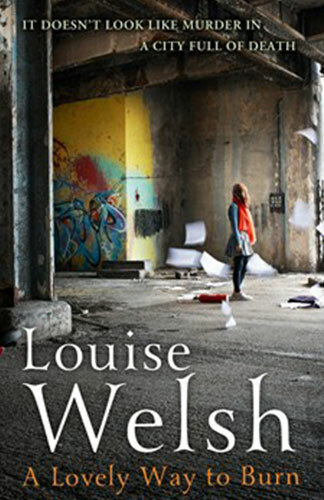 This is the premise of A Lovely Way to Burn, Scottish writer Louise Welsh’s sixth excursion into the genre of crime and the first in a trilogy with the over-arching title of The Plague Times. Think P.D. James and The Children of Men. It’s not the first time a crime writer has crossed into the genre territory of speculative fiction. It is, however, the first time that Welsh has introduced a protagonist who is both female and straight – although by the end of former journalist Stevie’s harrowing quest to find out how and why her doctor boyfriend Simon has been killed, she will have hacked off her hair and started wearing his suits. Welsh’s central characters usually experience a profound personal transformation. The bad haircut and the ill-fitting clothes are the disguise Stevie adopts in an attempt to erase her other identity as the attractive face of an all-night shopping show. The account of Stevie and her friend Joanie exchanging double entendres while flirting with the camera over a Dual Action Toaster at six in the morning is both wickedly funny and sad. Stevie suspects Joanie is in revenge mode, casting her former policeman lover as a character in a fantasy toast-fuelled marriage. Sadder still is the fact that when Joanie succumbs to ‘the sweats’, it is her policeman ex who comes briefly to Stevie’s aid, the first of many oddball characters to do so. For the most part, Stevie is on her own in trying to find how and why Simon died. Given everything else that is going on, no one seems to care except those eager to reclaim the incriminating laptop that he has hidden in her flat. We’re talking medical malpractice and big money here. Case solved, the future looks bleak. Checking her rear-view mirror as she escapes London, Stevie observes: ‘It was still dark, but there was a glow on the horizon that might have been the city burning, or a promise of dawn’. It’s the ambivalent ‘or’ that intrigues and the shadow of a sequel. Welsh still has her edge.